So the total count of items I had to query was about 5000 and according to the test conditions, the items which would match the query were not more than 1200 at a time. 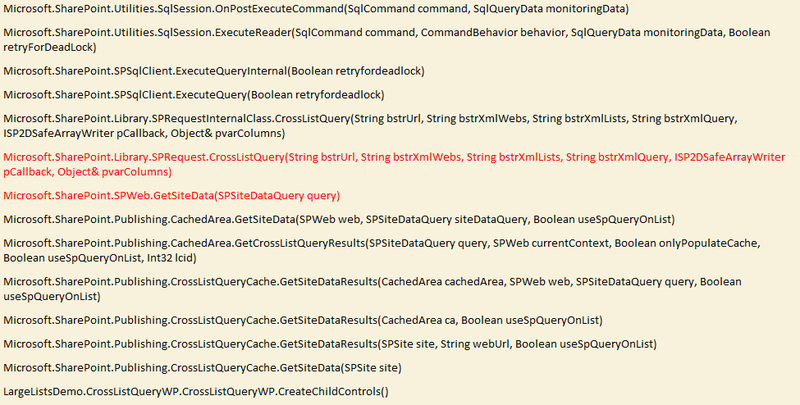 1) I was using the StopWatch Class from the System.Diagnostics namespace. This class provides a fairly simple and easy mechanism for recording the time a particular operation took to execute. 2) The Developer Dashboard has always been my goto tool for performance measuring. I don’t know how I used to get by before I started using it. It provides a wealth of information about the page load. It can provide you with the time taken, the database calls made, the stack trace and a whole lot of other very useful information. A good tutorial on the Developer Dashboard can be found here. The SPSiteDataQuery class is the heart of architecture when you want to get data from multiple sites. This class by itself does not use any form of caching and always returns data based on the real time queries. So even if it takes a bit longer to fetch the data, it is guaranteed that you will get all the current results and your users will never have to wait to see their new items to be returned by the query. So as you can see, it calls the SPRequest.CrossListQuery method which internally makes queries to the Database to fetch the relevant results. When querying the database the procedure proc_EnumListsWithMetadata is used. You can have a look at this procedure in your Content DB. 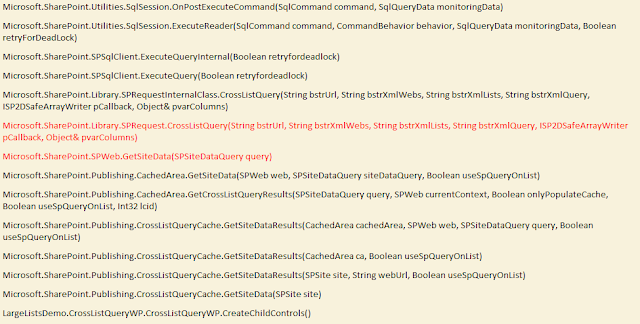 It queries several tables such as the dbo.AllLists, dbo.AllWebs etc. to fetch the relevant results. 650ms average on each load. The CrossListQueryInfo class is another mechanism you can use to fetch the List Items from multiple sites. This class internally uses the SPSiteDataQuery class to actually fetch the items from the database and when the items are returned, it stores them in the object cache of the Publishing Infrastructure. When any more calls to the same data are made subsequently, then the data is returned from the cache itself without making any more trips to the database. The working of the CrossListQueryInfo class largely depends on the object cache of the Publishing Features of SharePoint server. So you cannot use this class in SharePoint 2010 Foundation or in sandbox solutions. Also, the default expiry time of the object cache is set to 60 seconds. So you might want to change that time depending upon your environment requirements. Make sure to set the CrossListQueryInfo.UseCache as true if you want to use the caching features. Another very important thing to mention is that there are 4 overloads of the CrossListQueryCache.GetSiteData method and only 2 of them support caching. So only use the methods which accepts the SPSite object as one of the parameters if you want to use caching in your code. So as you can see, the Publishing.CachedArea is queried first to check whether the items exist in the cache. If they don’t exist, then a call to the SPSiteDataQuery is made which fetches the values from the database and stores it in the cache. All the next subsequent calls will find that the items are present in the cache so no more calls with the SPSiteDataQuery class will be made. As a result, the very first call will take longer than a vanilla SPSiteDataQuery call as under the hood, the CrossListQueryInfo is not only fetching the items but also building a cache with them. 2000ms on first load and 30ms average on each subsequent load until the object cache expires. The PortalSiteMapProvider is a class which can used to generate the navigation on SharePoint Publishing sites. The Global navigation, the Quick Launch and the Breadcrumb navigation can all be generated with help of the PortalSiteMapProvider. It also provides methods to query sub sites, lists and list items with help of caching. The main advantage of the PSMP is that it queries the SharePoint change log to check whether any changes have happened to the data being queried. If yes, then only the incremental changes are fetched and thus the cache is updated accordingly. However, my tests showed that the PortalSiteMapProvider.GetCachedSiteDataQuery method which is used to get items from multiple sub sites does not maintain an incremental cache and it only fetches the new or updated items when the object cache has expired. So essentially when querying for items from multiple sites, the CrossListQueryInfo and the PortalSiteMapProvider behave almost similarly. You can see that it’s very similar to the CrossListQueryInfo. So these are some of the methods you can use to query multiple List Items in multiple sites. Hope you had a good time reading through the post. Thanks Rahul! Really appreciate it. Nice article, Clearing the performance picture.